The Bald Eagle is the national symbol of the United States and is found on the presidential seal, money, and stamps. 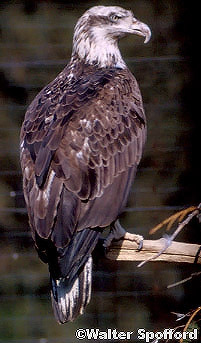 The Bald Eagle was placed on the endangered species list in 1973. It was removed from the list in 2007 after DDT and lead for waterfowl hunting was banned and efforts were made to protect nesting habitat. There was once a bounty on Bald Eagles in Alaska because it was believed that they competed directly with anglers. The bounty was eventually removed. Today, Bald Eagles are protected by state and federal laws. 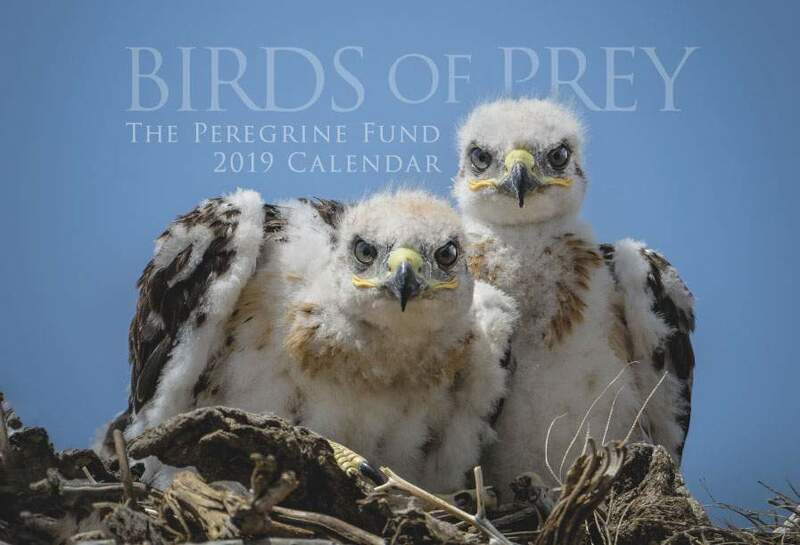 The Peregrine Fund has supported Bald Eagle conservation for decades. The Bald Eagle is found throughout North America. Though not cosmopolitan like the Osprey, it is still found in many different habitats throughout its range, which covers most of Alaska, Canada and the contiguous United States all the way south to northern Mexico. Like many raptors in the northern hemisphere, Bald Eagles are partially migratory, which means that some individuals will move to areas outside their breeding range at certain times of the year. Those living in the northern-most portion of their range will migrate south during the harsh winter months. In some far north regions, lakes and rivers will freeze over, severely limiting the eagle's food options. This leaves them little choice but to make the long journey south. Conversely, some Bald Eagles that live farther south will move northward outside of breeding season. Like Osprey, Bald Eagles are often found near large bodies of water such as sea coasts, rivers, swamps and large lakes. However, biologists have learned that when these eagles are not breeding, they are less tied to being near water and may be found in areas farther away from large water sources. Benjamin Franklin was famously not a fan of the Bald Eagle, perhaps because they sometimes steal food from other birds and scavenge on dead animals. The fact is that Bald Eagles, like all living things, do what they must to survive. Indeed, Bald Eagles are beautiful creatures with a lot of personality! With their bright white heads and tails and golden yellow eyes and beaks, Bald Eagles certainly stand out in the looks category. Their image is found on many U.S. government seals and stamps, and it has served as inspiration for wildlife painters, sculptors and photographers. Despite the Bald Eagle's majestic appearance, its vocalizations are high-pitched chirps that sound like they would come from a much smaller bird. Even Hollywood isn't impressed by the Bald Eagle's call. 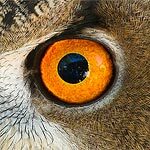 In the movies, the call of a Red-tailed Hawk can often be heard when an eagle comes on the screen. In the some parts of their range, particularly during fall and winter months, large numbers of Bald Eagles – sometimes up to several hundred – will roost together in large trees. This behavior is called communal roosting and is not yet completely understood by biologists. Bald Eagles also can be social eaters. When there is plenty of prey to be had, for instance after salmon spawn and die in rivers, hundreds of Bald Eagles may gather for the feast. 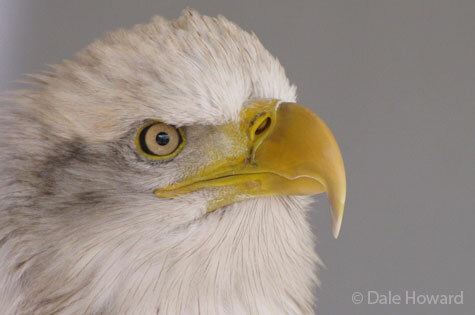 Like many other birds of prey, Bald Eagles were harshly affected by the eggshell thinning effects of DDT. During the mid 1900s, their populations fell sharply in parts of the United States and southern Canada for this reason. Biologists began working hard to save the Bald Eagle and the banning of DDT in the United States and Canada certainly helped these efforts. The species enjoyed a major recovery and numbers of Bald Eagles have increased greatly, but they still have many obstacles to face, including electrocution and lead poisoning. When an animal, such as a deer, is shot with a lead bullet, the bullet breaks up into tiny pieces that stay inside the animal. If a Bald Eagle, or any other birds of prey, feeds on the remains of these animals, they unknowingly swallow pieces of lead along with their meal. The lead poisons the eagles, which makes them very sick. If they are found in time and can be treated, they can sometimes be saved, but sadly, many of them don't survive. Though Bald Eagles are now more common, they still need our help to ensure that they continue to thrive throughout their range. Generally speaking, when it comes to food, Bald Eagles aren't picky. Though they feed primarily on fish, they are also opportunistic, which means if they have a chance to catch something to eat, they will take it! In fact, Bald Eagles will hunt just about anything they can catch, including mammals, such as rabbits and squirrels; birds like ducks, geese and coots; reptiles, including turtles; and amphibians. Bald Eagles also eat carrion, or the remains of dead animals. They can be found along roadsides feasting on road-killed deer or elk, on beaches feeding on washed up seals, otters, or whales, and even hanging out at waste dumps and fish-processing plants in the hope of securing an easy meal. 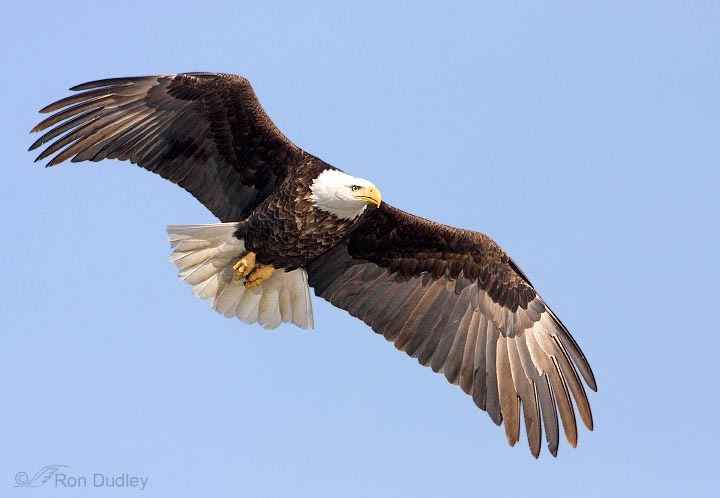 Bald Eagles tend to search for and hunt prey from a high perch before chasing after it. When they catch fish, they grab them from the surface of the water with their talons. Sometimes, when hunting in shallow water, they capture the fish in their beaks. Bald Eagles will also occasionally pirate, or steal, fish from Ospreys or other piscivorous, or fish-eating, birds. As you can see, Bald Eagles are very resourceful when it comes to finding a meal! 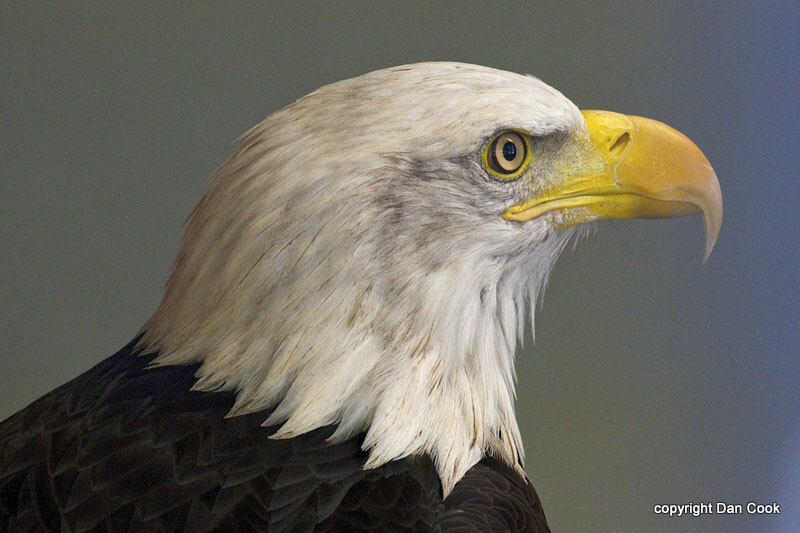 Bald Eagles are one of the champion nest builders of the raptor world. They construct huge nests out of sticks and use it year after year, continuing to add new nesting material each year. As a result, nests can be 10 feet high – about as tall as a one-story building! They normally build their nests in tall trees or on cliffs located near large bodies of water, though there are reports of nests on some man-made structures, including the seat of an abandoned bulldozer. During courtship, Bald Eagles put on some amazing flight displays, including grasping each other's talons in mid-air, then twirling at full speed toward the ground, separating at the last minute. 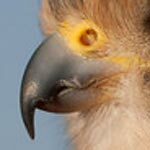 The female lays 1-3 eggs, sometimes four eggs, which are plain white without many distinguishing marks. Both parents share the duties of incubating and protecting their eggs and young from predators. They also both hunt and feed their offspring. After about 35 days of incubation, the young eagles hatch. Around 10-12 weeks later, these young eagles are ready to fly for the first time. 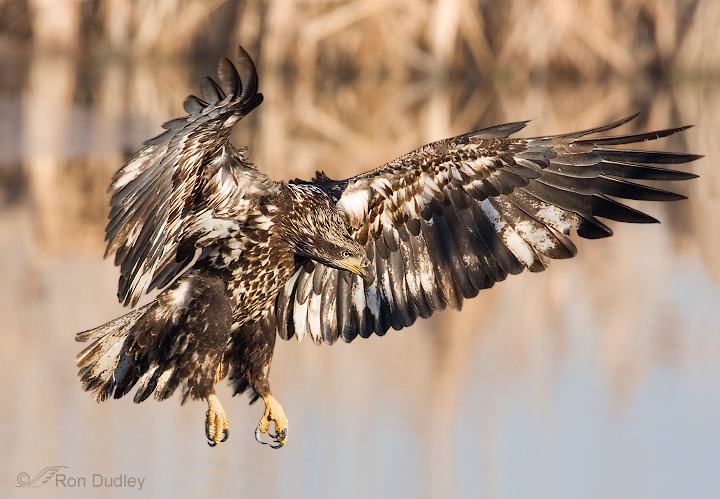 Like many raptors, young Bald Eagles practice flying before they actually take their first leap from their high nests. They flap their wings and lift up a few inches from the nest before settling back down, or they practice hopping from branch to branch in their nest tree. When Bald Eagles first hatch from their eggs, they are covered in white down. 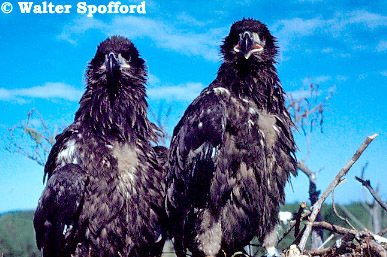 By the time they are ready to fly from the nest, their down has been replaced by dark brown flight feathers. Young Bald Eagles are entirely brown and can be confused with Golden Eagles if one doesn't look carefully enough. Each year, the eagle molts, or loses its old feathers as new ones grow in, and its plumage, or the color of its feathers, changes little by little. Patches of white feathers begin to show on their heads and tails. Finally, when the eagles reach adulthood at about 5 years, they exhibit the bright white head and tail that makes them so recognizable. After this, the eagles will continue to molt, but their coloration will not change. Biologists believe that Bald Eagles stay with the same mate for life. Though Idaho does have its share of breeding pairs, Bald Eagles can most easily be seen in Idaho during the winter months. Lake Coeur d'Alene is famous for its large concentrations of wintering eagles that gather to feed on dead salmon. 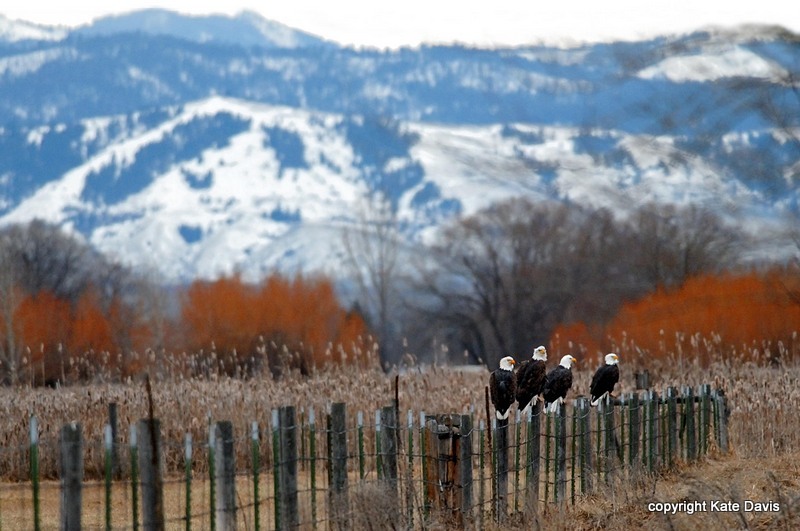 Bald Eagles also can be seen perched along the Snake and Boise rivers. If visiting the World Center for Birds of Prey in winter, watch for Bald Eagles soaring above the facilities. They also are regularly observed along the Boise Greenbelt, a short drive from The Peregrine Fund headquarters. The World Center for Birds of Prey offers visitors an opportunity to see a Bald Eagle up close. Housed in our outdoor facilities, Sky greets visitors year-round from her chamber. When you walk the interpretive trail that looks out over the Boise valley in the winter, you may be able to spot a Bald Eagle soaring over the grasslands or perched in a tree or on a distant power pole. The visitor center also features artwork depicting eagles and other birds of prey.